Mother-of-two, Penny Watson and her family discover shipwrecks and “bushman’s dunny paper” on a five-day campervan trip along one of Australia’s most iconic roads. “Mum. Mum. Muuuuuuuuuum. Why are they called the 12 Apostles? Why aren’t they called the Eight Apostles? What are apostles, Mum? Are you an apostle?” Apostle, no. Martyr, maybe. 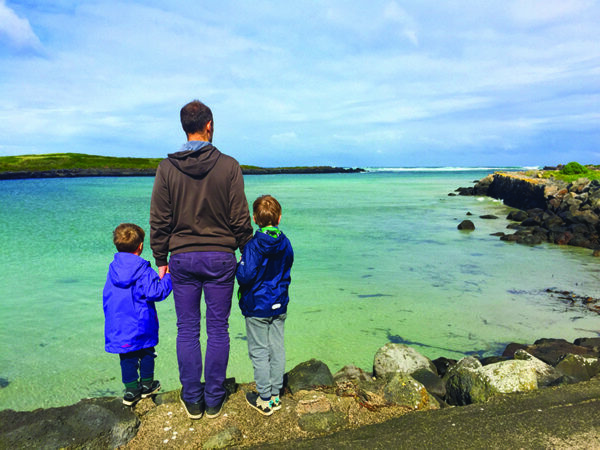 Fielding curly questions from two inquisitive children over the course of a five-day campervan trip can certainly test one’s inner patient parent. Happily for that inner patient-parent, no amount of questioning can undermine the joy of seeing your children totally and intellectually immersed in a destination. For the record, “Eight Apostles” is more accurate. The 12 Apostles are the magnificent bucket-list-ticking limestone rock stacks that rise out of the water near Port Campbell National Park, along Victoria’s Great Ocean Road. Over the years, four have fallen victim to the wild and rugged Southern Ocean and harsh weather conditions that eroded the rock in the first place. The ninth stack collapsed into the ocean in 2005, but it’s still a magnificent spectacle. On our visit there are moody dark clouds, the threat of rain and wind whipping up the waves. Whether it be eight or 12 apostles, the children love it. The 12 Apostles is the main attraction on this touring drive, but there are many pit stops along the way, so we logically needed a vehicle. 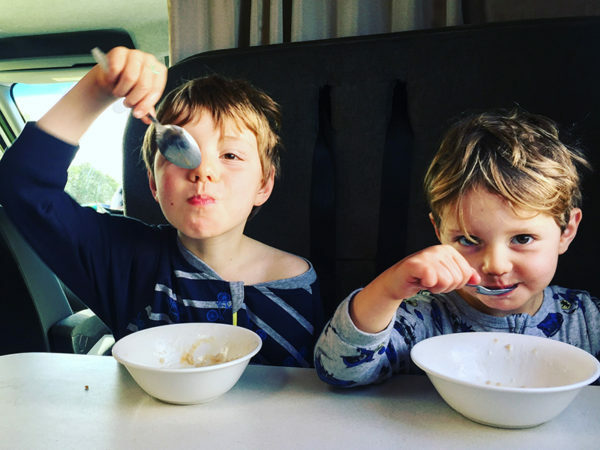 Turns out a six-berth campervan with all the extras is an excellent option: we’re in the same beds each night, there’s a fridge full of good food, a hot shower and even a toilet (“hooray,” says Mum). We’ve also got flexibility to go where we want, when we want. 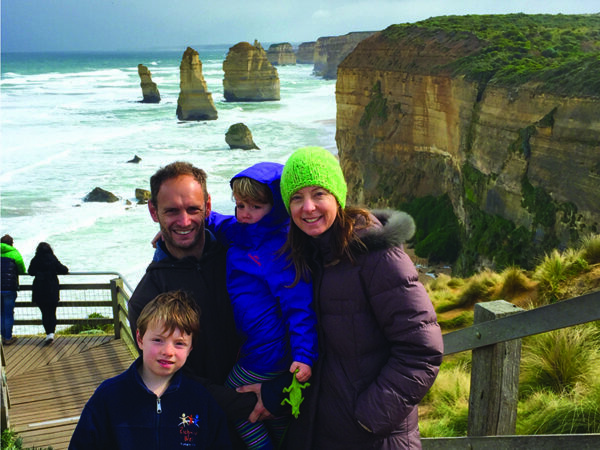 We drive the longest stint – the relatively straight road from Melbourne to Port Fairy – first, then make our slow wending way back along the Great Ocean Road over four nights. Warrnambool is the biggest town on the route, but we shamelessly drive straight through it to Logans Beach, a popular and easily accessed whale viewing platform. Within minutes, we see the dark humps riding the breakers not far from where we’d be swimming if it weren’t so wintry. A series of eight or nine breaches from one of the southern rights is an unexpected “wow” moment. Our second night is in tiny Peterborough at Great Ocean Road Campsite on Curdies River Inlet, but there’s more action in town at Port Campbell Holiday Park, which is close to the surf lifesaving club on a beach bookended by dramatic cliffs. It’s the perfect spot to huddle in the cold and scoff fish and chips from Frying Nemos. The 12 Apostles are close by, then it’s worth swinging inland to Otway Fly Treetop Walk. 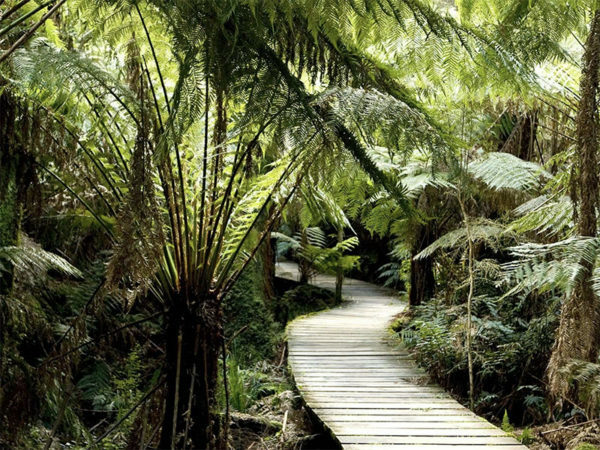 The 600-metre walk ascends 25 metres into cool temperate rainforest, which is, as we tell the kids, is a remnant from Gondwana days when dinosaurs roamed the Earth. A spiral staircase climbs to 47 metres for a sugar glider’s view from the canopy. Etienne and Digby are three and seven years old, and both equally excited about the ranger activity, a series of ‘did you know’ wildlife questions answered at various stations along the way. The blanket leaf tree known as “bushman’s dunny paper” also gets a lot of attention. That night we are the only people at wild Johanna Beach campsite in Great Otway National Park. It’s an unpowered site, but the campervan battery supplies all our power needs. We drift off to sleep to the sound of the ocean waves. The next morning, we learn that the beach was named after a boat shipwrecked here in the early 1800s. It’s a fitting story for that day’s visit to Cape Otway Lighthouse, where a salty-looking type regales us with stories of how this stretch of land became known as the Shipwreck Coast. It’s real-life pirate ship stuff. From Cape Otway, the road twists and turns, hugging the cliff-face on one side and the water on the other. Seaside towns have long sandy beachfronts suited to swimming when the weather allows. We stop instead for a raspberry lemonade at the pub in Wye River, which has one of the country’s best ocean-view balconies. At Cumberland River camping ground, we cook snags on a barbecue in an old barn and roast marshmallows on a log fire. On our final morning, we stroll around Lorne where gentle waves, trampolines, a playground, waterfront cafe (where you can hire cricket gear) and barbecues could take up a whole day. From here it’s about two-and-a-half hours back to Melbourne via Anglesea. Notably, the only question the kids didn’t ask on this trip was ‘are we there yet?’ That’s the great thing about campervanning: the destinations keep on coming.